They came from far--Portugal, France, Cyprus, Manchester, Orkney, Ireland--and near--Wales, Bristol, Chippenham--to the 7th Ukaramcons reunion in Bristol, September 21-23, 2018. ‘They’ are retirees of many years ready to catch up with old friends, make new friends, reminisce about good times in Saudi Arabia and above all have an enjoyable weekend. Friday started with a beautiful blue sky, which augured well for the Tom Henderson Memorial Golf Tournament played at the Woodspring Golf Club. How could the weather take such a turn for the worse, for at one stage the golfers had to shelter behind the golf buggies as they encountered 4 seasons--wind, rain sunshine and snow--in one morning? But ‘all’s well that ends well’ and Martin Wingrove won the tournament, Janet Scott had ‘nearest the hole’ and Jim Anderson, ‘longest drive’. 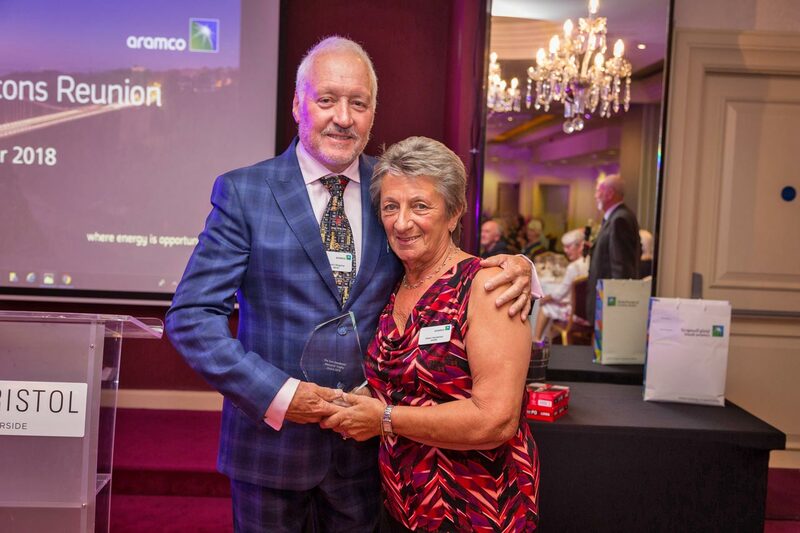 Awards were presented by Eileen Henderson, Tom’s widow, at the dinner on Saturday night. Mike and Sue Higgins with Veronica and Jimmy Anderson, event organisers. Friday night we adjourned to the Pitcher and Piano for a quiz and fish and chips. Quizmasters extraordinaire Sue and Mike Higgins did not let us down with a specialized quiz on...wait for it...Aramco! Many people took advantage of the hotel’s central location to hop on a bus and explore Bristol, spend time at many of the locations around the quay, or just visit the shops. 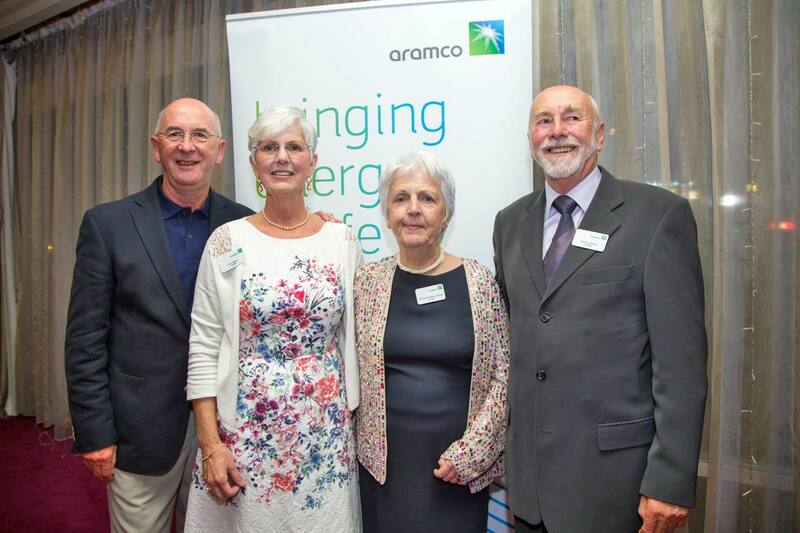 Saturday night everyone put on their ‘gladrags’ to attend the welcome reception followed by dinner sponsored by Aramco London Office. President and CEO of Aramco Overseas, Talal Al Marri welcomed everyone to the dinner and thanked them for their years of service with Aramco. He especially mentioned how important expats have been in training the Saudi workforce. Also in attendance were Khalid Al Mulhim from Dhahran, Ali Baluchi, and Abdullah Al Abdullah, Corporate Communications Director Aramco Overseas. A good time was had by all and everyone parted with the sign off ‘see you in two years’. If you wish to attend the next Ukaramcons reunion in 2020 please email [email protected].